Five Elements Hostel Frankfurt is in a great location just around the corner from the Hauptbahnhof and about 15 minutes' walk from the Alte Oper. This safe and comfortable hostel features free dinners and activities every day and also has an onsite bar open 24/7. Several Hostelworld guests have told us that they'd stay here again, citing the games room with foosball and pool table and the Wi-Fi throughout the building. Famous for our tasty FREE crêpes, yummy FREE pasta, delicious FREE homemade dinners, our 24/7 bar, and much more! We do our best to make your stay unforgettable. There's something going on every night! No more aching backs! We offer new, comfortable mattress in all rooms (20cm spring mattresses, and 16cm soft foam mattresses) to ensure you have the most comfortable stay with us. We have breakfast every morning from 7:30-12 for 6,50 EUR. Our breakfast is vegetarian, and vegan friendly as we offer a variety of breakfast foods, ranging from different breads, locally sourced meats (local sausage & bacon), fruits, vegetables, cheeses, hummus, lentil spreads, yogurts, nuts, cereals, muesli, jams, and more! We're also proud of the fact that the majority of our foods come without packaging, as a way to help reduce waste. Check our website and Facebook for special events, special food offers, and news. There is one tiny downside to our LOCATION: we are located smack dab in the middle of the RED LIGHT DISTRICT! Anyhow, it is NOT at all dangerous and our hostel has a HIGH safety standard. We only mention this so you don't find yourself surprised upon arrival. Our neighbourhood is home to some of the best food and clubs Frankfurt has to offer. In fact, the New York Times even wrote an article on our upcoming neighbourhood in 2016! However, if you don't feel comfortable staying in this area, feel free to book somewhere else. And - we promise - you'll find the best international food in our neighbourhood! Look out for our LAST MINUTE SPECIALS (each bed 19,- Euro one day before arrival), and our seasonal specials. Want to see what is going on at the hostel now? Follow us on Facebook, Instagram and Twitter! If you have any further questions, please feel free to contact one of our lovely office team members: Esther, Agne, and David. They're always happy to help you. Een leuk hostel. Alleen jammer dat het in een nogal onrustige omgeving staat. Met name de rondhangende mensen in de buurt geven een onveilig gevoel. Gelukkig gaat het hostel daar goed mee om, door zeer zorgvuldig hun gasten binnen te laten. De kamer was ook goed. Was even verrast dat je iedere dag schone handdoeken kunt krijgen! Dat ben ik niet gewend bij een jeugdherberg. Zeer aangenaam. ±5 min walk from the main train station. Nice common areas with pooltable and bar. The rooms were nice, though there is no air-conditioning. You have to bring your own padlock for the lockers. The area is a bit sketchy, we felt pretty uncomfortable walking around at the neighborhood in the evening. Goed hostel, maar locatie is niet echt fijn. Veel crackgebruikers op straat. Geen fijne sfeer buiten hostel. In hostel wel! I'd say our most unique feature is that our staff love the hostel and our guests so much that they end up spending lots of their free time at the hostel! There's always someone you can talk to here. Really, our staff have been called the most friendly staff in Germany. There's free activities every night, plus billiards, a bar and a backyard. We're quite close to the main station. We've quite close to the Main River, the museums, the botanical gardens and shopping malls. The one local place that I'd definitely recommend is the Äppelwoi pub quarter in Sachsenhausen. It's full of small unique stores, bars and restaurants. 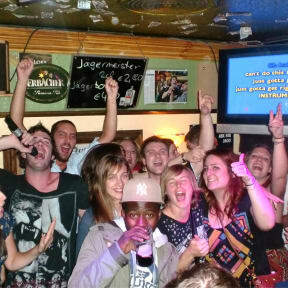 We like it so much that we offer a free pub crawl through Sachsenhausen once a week.